No other Facial in the world today is able to do what this Amazing facial can do. Offers a truly unique, elevated experience - The results are shocking, addictive and undeniable. Discover IT! Pamper Yourself with IT! Love IT! Take your skin to a new level of Amazing with a Pearl Powder at-home facial treatment. This luxurious facial is used in spas, clinics, and doctor’s offices around the world to treat a multitude of health and skin conditions. Pearl Powder facial stimulates the production of collagen and elastin, and accelerates the repair of damaged skin cells and cellular metabolism. You will visibly see a dramatic reduction and improvement in the appearance of fine lines, wrinkles, crow's-feet and age spots. Pearl absorbs deep into the skins tissue repairing, regenerating, and stimulating collagen and elastin synthesis. Pearl Powder facial treatment is non-abrasive, non-invasive, painless, with absolutely no downtime. It is safe for all skin type and all ages. Used on a regular basis, your collagen and elastin production will be kept at a high level, leading to much healthier skin and less wrinkles and blemishes. Pearl helps renew and refresh, and treats acne, rosacea and eczema. It is easy to do this efficacious anti-aging treatment and get an invigorating facial in the comfort of your own home at a fraction of the cost. If your desire is to look young - if you want soft, ageless skin with a luminous sheen, Pearl Powder is the secret for a new, beautiful you. What Can A Pearl Powder Facial Do For Me? Pearl Powder gently polishes the skin and removes and clean obstacles that clog enlarge pores. It fades acne scaring, lightens and evens out skin tone, eliminates white heads and black heads, reduces large pores and revitalize dull skin. It cleanses dirt, oil and makeup and kills bacteria for cleaner, younger looking skin. Pearl Powder is the most profound treatment for removing dead skin. Failing to exfoliate, dead skin blocks new skin growth, prevents pores from expelling bacteria, and obstructs skin care products from absorbing into the skin. Pearl Powder is the most gentle and effective exfoliate on the market today. 100% Natural - 100% Safe. 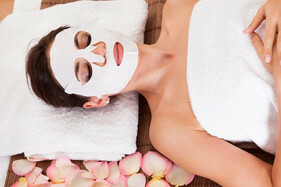 After your facial treatment your skin will feel as soft as doctor's cotton and as smooth as silk. Years will be removed from your face and your makeup will go on easily and smoothly! 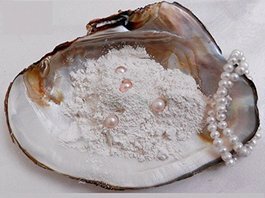 Pearl Powder is good for all skin types and works to normalize skin as it should be by allowing skin to detoxify, and by removing this unwanted lining it lifts the weight on the facial skin (this weight on the face causes skin to sag and jawls to droop which in turn causes excess wrinkles). Always remember. Consistancy is the Key. If you don't use it regularly, at least 1 to 2 times a week, you cannot expect for it to work effectively for you. Treat yourself like Royalty and Give yourself the ultimate facial treatment today. You'll be glad you did. Egg whites have astringent properties that help shrink pores by tightening the skin. Before applying, first wash your face gently with warm water and pat dry with a soft towel. Mix 1 teaspoon of egg white and 1/4 tsp pearl powder, and wisk well. Coat your face with a thin layer and let it dry for 10-15 minuets. Avoid the areas around your nose, mouth, and eyes. Gently wash off with tepid water. Let air dry. If you don't want to waste the remainder of egg white add 1/4 tsp pearl powder, mix and slather it all over your hair. Cover your hair with a shower cap to prevent drips and sit back for 10 minutes. When the time is up, rinse off thoroughly and let your hair dry naturally. Your hair will look shiny when dry which is one of the magical properties of egg white and pearl powder combined! The Oriental are known to be long-standing people, and their women have always been considered to look beautiful and youthful, even at older ages. That is all cause of their secret. Their secret lies in the healthy properties of both pearl powder and rice. Rice and Pearl Powder are loaded with healthy nutrients, such as linoleic acid and squalene, which are powerful antioxidants that stimulate collagen production, which reduces and prevents the appearance of skin wrinkles. This treatment works as a miracle cure! Try this facial mask and see for yourself. 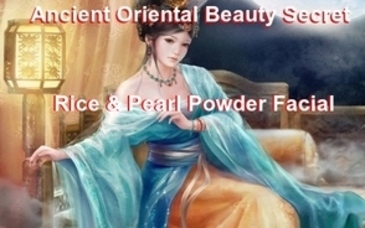 This ancient Oriental facial mask recipe will smooth your wrinkles and rejuvenate your skin. You will see an immediate difference in the look and feel of your skin. This facial is very simple and easy to make. You just have to follow the simple instructions. Put 3 tbs. rice in a pan with 1 cup of water. Boil, then let it simmer for 3 minutes. Remove from heat, let cool and strain mixture. In glass bowl, add boiled rice, honey, warm milk, and pearl powder. Mix ingredients, until it's like a paste. Next, Cleanse your face and apply this facial mask on your face and massage gently – in circular motions. Leave on for 15 minutes, then wash off with warm water. Use this mask once a week. 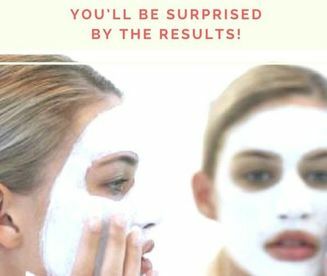 You will be amazed by the results. This homemade face mask leaves skin smooth, firm and elastic. It has the same effect as a Botox treatment. Try it now and see the amazing results! Boil 1 cup distilled water. Add cornstarch to water and let simmer until thickened. Let cool at room temperature. Add pearl powder, 5 tbsp carrot juice and yogurt. Mix well. Apply the mask on clean face and neck. Leave it on for 20-25 minutes, then rinse with warm water and let dry. Apply a good moistuizing cream. I suggest using Sarah's Deep Winkle Pearl Cream. The remaining mixture should be kept in the refrigerator. Apply mask twice a week to achieve astonishing results. This facial is for Dark Spots, Freckles, Pigmentations, Melasma, etc. Promote cell renewal and regulate skin discoloration. Hydrates the skin and exfoliates. Mix 1/2 tsp Pearl Powder in small bowl, then add a small amount of milk to make paste. If you prefer a thicker mask, add some honey. Next, wash your face with warm water and apply mixture to face and neck. The places with pigmentations, dark spots, freckles, melasma etc, apply a little more and massage into those spots with your fingers. Wash the mask off after 15-20 minutes with warm water. Use this method once or twice a week, but for dark spots, age spots, pigmentations, melasma etc., apply on spots every night before you retire. Use back of a spoon and mash banana. Add butter, pearl powder and green tea and mix together. Apply the mixture on your face and leave for 15-20 minutes. Wash off with warm water. 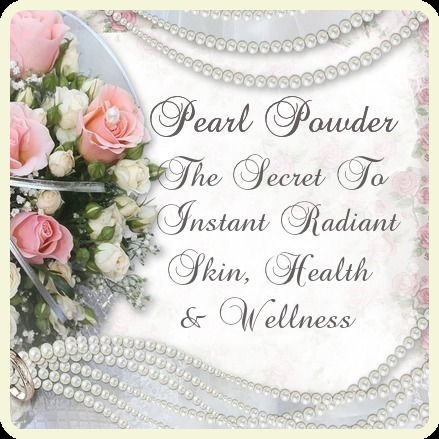 Pearl Powder is a natural skin brightener. It leaves an instant pearlescent glow to the skin, giving a more natural radiance and brightening effect. 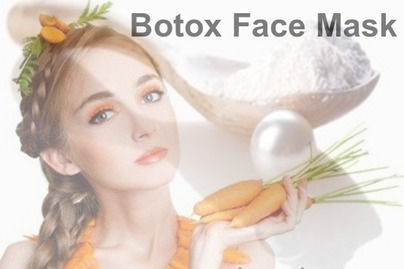 Dried orange peels, pearl powder, and yogurt brightens the skin. If your skin looks waned and feels rough to the touch, you need a brightening technique. This skin brightener nourishes tired fatigued skin by evening out skin tone and smoothing skin texture, and leaves a permanent glow. Your skin will look brighter and more awake in no time! 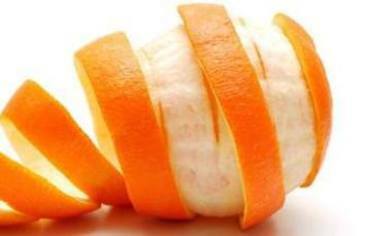 Place orange peels under hot sun until they turn dry and crisp. Then, grind the peels into powder. Mix orange powder with 1/2 tsp pearl powder. Add 1 tbsp fresh yogurt to make a paste. Apply over cleansed face and leave on for 20 minutes. Repeat this twice a week. Mix 1/2 tsp Pearl Powder with a few drops of lemon juice and coconut oil. Apply to the face, let sit for 15 minuets, and rinse with lukewarm water. Worried about the wrinkles, acne, blemishes, allergies or dark spots on your face? Well, you don’t need to get any chemical treatments to get rid of them. An easy and natural remedy for this is pearl powder and guava leaves. Finely Mash guava leaves (I use a coffe grinder to a powder). Put 1/2 tsp powdered leaves into small bowl or cup. Add 1/2 tsp pearl powder and enough water to make a paste. This makes the ideal scrub. Apply the mixture to your face and neck, and let sit for 15-20 minuets. Wash off with warm water, let air dry. Be careful not to get any into your eyes. Repeat once a week. Both High Quality Pearl Powder and Guava leaves fight bacteria and have anti-inflammatory properties. The anti-bacterial quality of the Guava leaves makes it difficult for any germs to enter your skin and cause acne. Additionally, the skin becomes smooth with regular application thereby making the pimples disappear. Furthermore, pearl powder and guava leaves are also reliable when it comes to skin reactions and allergies. This dynamic duo can decrease the appearance of acne. To make a pearl powder guava leaves wash, mash a handful of leaves to a powder. Add 1/2 tsp guava leaf powder to 1/2 tsp pearl powder and enough distilled water to make a paste. Put some on the effected areas. After 10 to 15 minutes, rinse with lukewarm water. Repeat the process twice a week. 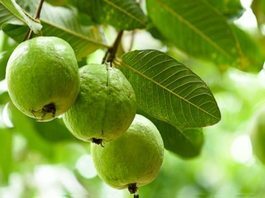 To prepare the guava remedy you need a handful of dried leaves. Add them to a pot of boiling water. When the water turns brown, remove from the stove, and let the solution cool down. This will let it become more concentrated. Then, put 1/2 tsp pearl powder in bowl, add enough quavel leave liquid to make a paste. Apply the paste over the affected area with a cotton pad. After 15 minutes rinse with clean water. Repeat the process twice a week and you will see the allergic reaction disappear. Experience dramatic anti-aging results. This facial does it all in 4 easy steps. Combines the power of a exfoliator to remove dead skin cells, all while infusing the skin with cleansing, hydrating, and moisturizing cream and serums to immediately repair and rejuvenate. It offers instant, noticeable results with no downtime or irritation. 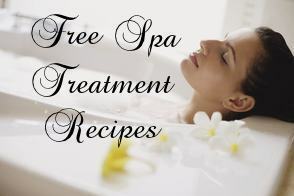 Treatment is soothing, non-irritating and immediately effective. Reduce the appearance of fine lines and wrinkles and recharge skin with a patented combination of peptides. Minimize the appearance of dark spots and sun spots for an even complexion. This spa facial penetrates the skin to firm and tone the skin at a cellular level, rebuilding collagen and reducing crepiness. Instant Face lift and Conditioning Kit. 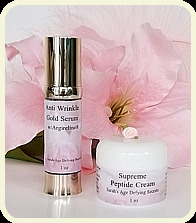 Anti Wrinkle 55 Gold, Cinderella Instant Skin-Tight Serum and Supreme Peptide Cream. Goes beyond minimizing fine lines and wrinkles, it makes an abrupt change in the skin cells and restores skin’s natural cellular collagen activity. Provides a healthy skin tone and Repairs Damaged Skin. Once you experience one of these Posh, Luxury Pearl Powder Facials, your skin will never be the same. Create a true spa experience and environment that’s a pure joy to escape and retreat from everyday life- whether you have medical issues to work through or you’re simply looking for a relaxing way to reduce stress or infuse energy. It is imperative after your facial that you use a good quality moisturizer and or serum. The products below are proven to be the top skin care products in the industry, at a price you can afford.